2010 7DRL Challenge – Day 7. Ruler v0.1 released! As usual, I forgot whatever lessons learned from last year and yet again tried to do something too big, I’m glad I could at least get a portion of what I wanted! Be careful though, because you can only count with your life and your loyal servants. If you die, you will never know what will happen to your civilization! Find a good place for your first 2 settlements, you want a place with food around (grassland, oceans and rivers are good places). You will watch your cities grow in time! Travel around looking for barbarian settlements to claim for you. Be careful not to run out of supplies! you can always go to one of your cities and refill. Create units in your cities and Enlist them into your group, so that you can keep conquering and expanding! If you can’t create units, it may be because you don’t have enough resources! you can try trading resources from one settlement to another. Create a caravan (needs trader specialists) and load resources from a settlement, travel to the destination settlement and establish a trade route to exchange resources! Create sea unit and add them to your group to travel the seas! Invested a lot of time trying to get a working Civilization AI, in the end… it works, but it’s not guaranteed to live for long :), I also added units from Stone to Future Age, and 7 civilizations. I will release the source code, just in case anybody wants to contribute! Congratulations to all the 7DRL Winners! 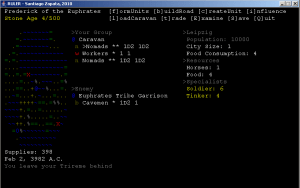 Units can now be created at cities and added to unit groups. They need available resources from the city in order to be created. Such resources are captured from the surroundings of the city. 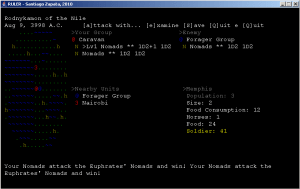 Caravan units can trade 1 resource of one city for 1 resource of other city, so that you can bring the horses to that far away land. You can also influence your cities in order for them to grow the specialists you need for those cool units. Time is running out, (I advanced one hour less than expected, and invested about 2:00 more). I guess it’s time to cut the scope again! Settlements now grow over time and collect resources from their surroundings, they also train specialists; units also level up now. First available version! Download for testing purposes from here ! The end comes near… I’ve started cutting unneeded scope. For some minutes today, I thought I had lost control of the project and the scope was too big again… but I regained hope some minutes later, it can be done! 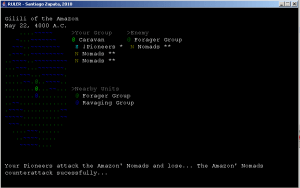 Combat has been added (although the enemy AI doesn’t attack… yet… but it can counter attack! You can also select your leading unit. Serf has been pretty useful to get this far, but I’m still behind schedule… I will have to plan something tomorrow! 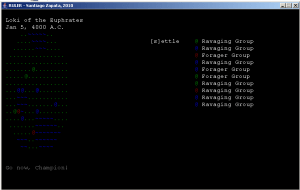 Barbarians lurk in the land, staring at me curiously! I am a bit behind schedule! must plan a bit tomorrow to ensure this will get done well! 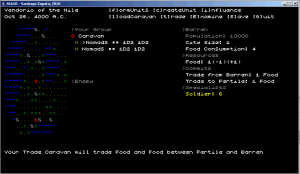 The Ruler project is now set up using Serf, and basic unit groups, units, civilizations and map are all set up. 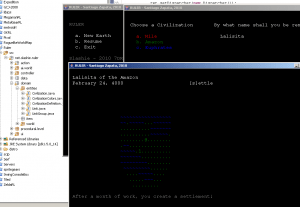 Calendar is also running, using a passive actor. You can walk in the (randomly generated) map and create settlements using your pioneer caravans.